Yesterday I found the required USB cable to connect my MacBook to the keyboard we purchased for the “kids”. But nothing happened…. After a few minutes Googling I found that Casio only provide Windows drivers… But then I found a GoggleCode project to provide Mac OS X USB MIDI drivers for Casio keyboards. Oh happy times. Tada, the Audio Midi Setup (Applications/Utilities) could see the keyboard, and GarageBand could record the input. Now I’m interested to see what the kids will create. For Snow Leopard there is an installer package now on the above linked driver, so use that for Snow Leopard installs. Then click on the down arrow at bottom of the Casio USB MIDI Interface. You keyboard should make lots of noise. Its working. Thanks so much! I’m troubleshooting a friend’s setup, and this just helped me out a bunch. Thank You! I was so confused and so was everyone on the forums. You just changed my life and got me one step closer to musical freedom. I thought I was dead in the water with that casio! Thank you! You made a big difference in my life. I started composing music!!! Please send me your e-mail ID for me to send my first song!! Hi Bala, I’m really glad this helped. I’m having troubles with following youre description. I have a Mac G5 not a MacBook.. I have downloaded youre file but it doesn’t work. I just got a new Macbook. Im not very good with technology, but it appears that the download is not working. I dont know if I did something wrong with it. So you have opened the zip file, copied CasioUSBMIDIDriver into ‘Library/Audio/MIDI Drivers’, then rebooted, and then when you run Audio Midi Setup (Applications/Utilities) with the keyboard plugged-in do you see nothing? It didn’t work for me so far… unfortunately! My library does contain an audio folder, but it has no folder named ‘midi’ or ‘midi devices’, to put the driver in and make it happen. What to do? um, at a wild guess, try create the directory “MIDI Drivers”, the place the driver in there, reboot, and see if that works. Hi There! I too am trying to use my Casio CTk 800 with Garage Band or Logic to no avail. It seems your trying to manually run the driver, after having unzipped it. All you need to-do is place (copy) the driver to the correct location, and then reboot you Mac. Eeek! LOL. What would be the correct location? I’ve updated the post to make thing more obvious. But ‘/Library/Audio/MIDI Drivers’ is where you want to put it, make sure you reboot. it wont download, safari says it can’t open the file. 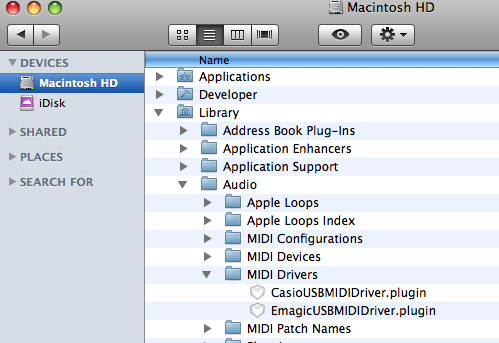 Well I just downloaded the CasioUSBMIDIDriver.r9.plugin.zip(Pre-Snow Leopard) just now and saved correctly. So maybe you need to right click and do a save-as instead of just clicking on the file. A BIG Thank you !!!!!!! I can finally composing my music ! oh yeah !!! It’s gonna be a goooooood weekend ! So I’ve done all of this and for some reason, garageband is still not picking up my casio keyboard. Any help would be greatly appreciated as I really don’t want to feel as if I’ve just wasted a fair bit of money, on the purchase of my CTK-800. I’ve not used this driver since updating to Snow Leopard, so I’ll check if my system still works night. Will let you know. Well I installed the new 32/64 bit Snow Leopard package, and it seemed to install without a hitch, but unfortunately I don’t have the correct USB cable at home, so I’ll bring one home tomorrow and test with that. Okay so First of all the Casio 800 does not have midi out only a usb out…..I am trying to connect the usb to my mac book pro…..using logic pro 9 I am not getting any new device reconized why i open up logic please help me. Hi Paul, just letting you know that yes, it works just fine with the newer Installer package and Snow Leopard. Your correct it’s not a normal MIDI port, but something better, a USB port which has all one needs to connect and control multiple devices on a bus. 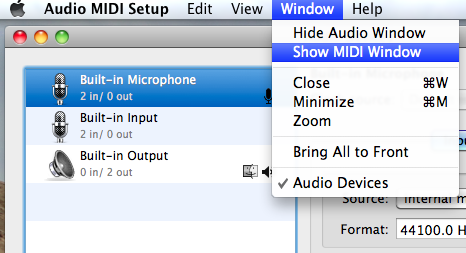 Check that you can see your device in the “Audio MIDI Setup” utility. I did not see my device in the base screen, so reboot, and then didn’t see, so found the “Show MIDI Window” under “Windows” and my device was present there. I then clicked on the Test Setup button then pressed the down black arrow on the icon, and my keyboard made a huge noise. Thus first test your keyboard in present and working. For me I then could use my keyboard in GarageBand, albeit it was quite. Thank you SO MUCH FOR THIS!!! I really appreciate the time and effort you put in.